The art scene today is one of appropriation-of remixing, reusing, and recombining the works of other artists. From the musical mash-ups of Girl Talk to the pop-culture borrowings of Damien Hirst and Jeff Koons, it's clear that the artistic landscape is shifting-which leads to some tricky legal and philosophical questions. 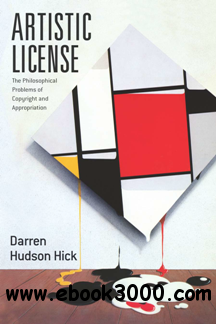 In this up-to-date, thorough, and accessible analysis of the right to copyright, Darren Hudson Hick works to reconcile the growing practice of artistic appropriation with innovative views of artists' rights, both legal and moral. Engaging with long-standing debates about the nature of originality, authorship, and artists' rights, Hick examines the philosophical challenges presented by the role of intellectual property in the artworld and vice versa. Using real-life examples of artists who have incorporated copyrighted works into their art, he explores issues of artistic creation and the nature of infringement as they are informed by analytical aesthetics and legal and critical theory. Ultimately, Artistic License provides a critical and systematic analysis of the key philosophical issues that underlie copyright policy, rethinking the relationship between artist, artwork, and the law.